When picking out a new hose, either to replace a damaged or worn one or to reduce the amount of weight you have to lug around, be sure not to over buy. A fifty foot hose is a waste on a twenty foot patio. Also be aware that many hoses come with spray attachments. If you're trying to water fragile pots or delicate plants, a misting attachment could save you a lot of cleanup and keep especially detailed plants, such as baby's breath, from getting battered down by water spray. It´s also great for watering your organic veggie garden and fruits. On the other hand, if you need a 200 foot garden hose, you'll probably have to run multiple hoses out to your plantings. Among the lightweight hoses, 100 feet seems to be the standard. If you'll need to water a long distant area repeatedly, consider putting in a temporary hose bib to which you can run your 100 ft garden hose. While you can purchase a free standing hose bib and reel made of ornate metal, this gardener did a great job of using up a short 4 x 4 fence post, some leftover paint and some help from his family to build a useful hose mount. Of course, you'll be happiest putting your temporary hose bib about 100 feet from your spigot, then running another 100 feet of hose from there. The nice thing about fabric hoses is that they generally collapse into a very small package and are easy to store. However, if you need to cover a lot of ground with your hose, these will be hard to stretch out. Fabric hoses actually need water to expand fully. 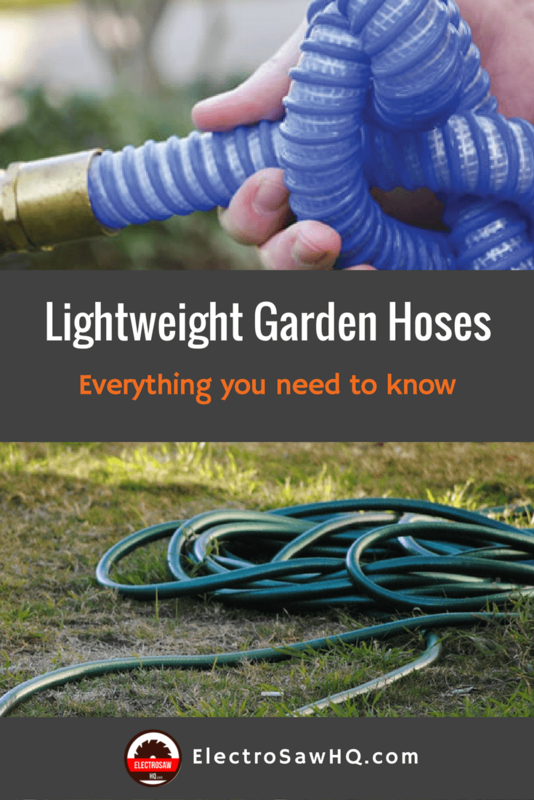 While this is handy for patio gardens or small yards, a polymer based hose will act more like a rubber hose, laying flat when you need to lay it out and making it easy to control the path of your sprinklers or other watering tools. 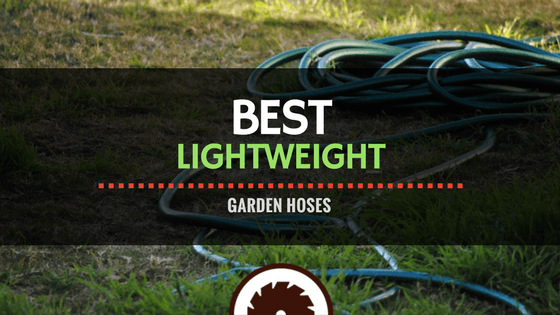 Many of the best lightweight garden hose options of 2018 come in a variety of colors. If you've ever clipped a garden hose with your lawnmower or hit one with a string trimmer, you know that a dark green garden hose can be hard to see. Luckily, the Flexzilla is bright green and very easy to spot in the grass. The Water Right product line is available in a variety of colors from olive green to plum. This slim hose has quite a shine to it and will also be easy to spot.Of the fabric water hoses available, two are black. These collapsible hoses are well suited to hose bib and would be great tools for a patio garden. The Ohuhu lightweight, tangle free hose is a bright, vibrant blue. Depending on where you live, you may never need to put your hose away; you may never face a freeze. The VELA flexible hose is a great choice for warm climates as it's 100% UV-Resistant and won't rot or fade in the sun. Other products featured in flex water hose reviews can tolerate up to 40 degrees below zero. However, as most of us don't have much watering to do once it's that cold, your best bet is to drain your hoses before storing so you can use them next year. Most importantly, no matter how cold a temperature your new hose will tolerate, always be certain to unhook the hoses from your spigots before a freeze! Ready to own a hose you're never going to lose sight of in the grass? The Tuff-Guard line comes in a variety of colors, including pink, royal blue and red. This flexible and kink proof garden hose is built in multiple layers of polypropylene for strength and can handle 100 psi. No Tuff Guard hose review would be complete without mentioning how much watering power you get in only seven pounds of hose. A fifty foot version of this hose is only 7 pounds. A great deal of the weight is in the corrosion resistant brass couplings. When compared with a Flexogen hose review, this hose has as much pressure tolerance, is kink free and weighs less. If you do have a leak or break in this hose, you can't repair it; the ridges make it impossible to attach new fittings. The bright green Flexzilla is another hose that you won't lose in the grass. This hose offers 50 feet of watering flexibility in only 8 pounds. The connectors are made of anodized aluminum, both durable and corrosion resistant. This hose is lead free and drinking water safe. While many garden hoses do not produce safe drinking wate﻿r due to lead content, this hose is lead-free. If you like to hook up the sprinkler on hot days for your kids to play in, this is a much safer option. The Flexzilla has no memory; it coils easily and lays out as flat garden hose when you need to stretch it out into your yard. It will tolerate up to -40 degrees Fahrenheit. Some users have found that this hose turns black over time. As this may be mold, do not use this hose for drinking water if you see a color change! The Water Right line of hoses was designed and built by a family of gardeners, and it shows. These extremely lightweight garden hoses are drinking water safe, tolerate temperatures from below freezing to 140 degrees Fahrenheit, and are available in colors including plum and cranberry. The connections are corrosion resistant and extremely durable, including chrome plated brass and stainless steel. The fifty foot hose is only four pounds and will work extremely well on a reel. If you need to pull a hose from a reel that you can roll up, this product may be a great choice. These hoses are not kink free. If you need it to lay flat in the yard, be ready to do a lot of twirling and uncoiling. The VELA offers 75 feet of watering flexibility in only 3.1 pounds. The fittings are solid brass and this hose comes with a watering tool with 9 different settings. You can mist delicate flowers and wash your siding with one flexible tool! The VELA is collapsible. It will lay out in the landscape when full and shrink back down to hang on the hose bib when you turn the water off. The hose bib (included) is an ideal fit for your existing hose reel, so if you need watering flexibility far from your spigot, this is a great tool. Collapsible hoses may not fully stretch out when dry; don't tug on it, but be prepared to move it as it fills with water. If you're looking for a lightweight 100 foot water hose, the Ohuhu product line will give you that and more. This bright blue hose starts out 33 feet long and expands to 100 feet as it fills with water. Like a lot of fabric hoses, it needs water to expand, so be prepared to move it as it fills. This hose comes with a sprayer and manual shutoff insert. You can stretch this hose out for your lawn sprinkler or use the hand sprayer and take care of foundation plantings. Whatever you need, you're covered! Some users struggle with leaks, and others find the hand sprayer is hard to attach securely enough so it doesn't leak as well. Of the best rated garden hoses discussed, the VELA is the most flexible choice. This very lightweight hose can hang around on your hose reel or fence until you need it, then be easy to move around in the landscape. Of course, your hose picks need to conform to your yard, family and climate. Happy watering!